Meditations on Maoism -- Ye Fu's "Hard Road Home"
A great divide separates the worldviews of the average Chinese and American. The most profound description of this divide I have heard came from the mouth of a friend who has never been to America and who was not a historian nor accustomed to deep political reflection and debate. She concluded that Americans lived in a different world than the one she and her countrymen knew on the strength of a single observation: "In America all of your most exciting movies are about the future. In China, our blockbusters are all about the past." This rather mundane observation points to a paradox of modern Chinese culture. The people of China are steeped in history. Places, figures, and sayings from most ancient times fill their cinemas and televisions, inspire their literature and music, and find their way into both their daily conversation and clever turns of phrase. One cannot study the Chinese language or befriend the people who speak it without realizing how proudly the Chinese people trace their identity some three thousand years into the past. It defines who they are and what they want their country to be. When China's heavy laden allow themselves a hopeful glimpse into the future the first thing they see are the glories of the past. Thus the dreadful irony: despite the high esteem which they hold for history and the strong affinity they feel with the triumphs and humiliations of their civilization, few Chinese feel any connection to--and in many cases, have no real knowledge of--their country's more immediate past. As a society they honor the stories and glories of tradition, but have abandoned headlong the social order from which these stories sprang. This was not entirely intentional. Seven decades of war, famine, and revolution ripped Chinese civilization apart at its seams and the old order of family and clan, official and elite, emperor and loyal subject disappeared. Today the patterns which held Chinese civilization together for a millennium are acknowledged, but honored mostly as the creation of some mythical past whose connection to the present is more a matter of style than of substance. In between this golden past and frantic present lies a gaping hole. A swirl of confused details, loathsome slogans, and obscured calamities lies in this abyss, little talked about and, in the minds of many, best forgotten. The grim episodes of those days are but a dim image in a mirror, only tethered to the present with fading memories of tumult and terror. 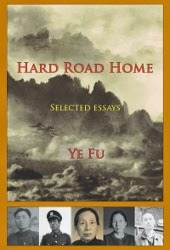 I did not fully appreciate how great a gulf this separation from the past has gashed in the Chinese mental landscape until I read a newly translated set of essays and meditations published under the name Hard Road Home. The author is a self proclaimed Chinese "liberal" named Zheng Shiping, though he writes under the pen name "Ye Fu." This title is perhaps best translated as "The Wild Man." Like the Daoist hermits of antiquity, his meditations do not match the spirit of his age and could be rightly called the musings of a wild hermit who "goes his own way." Ye Fu's way leads to his ancestral roots in the hills of rural China. There he finds his muse: his family, his country and their shared past. Americans-and particularly American conservatives-are sometimes accused of failing to confront their country's past honestly. Ye Fu's challenge--and in many respects all of China's--was not honestly facing his past, but simply finding it. Ye Fu was born the great grandson of a ranking Nationalist commander, the grand son of a landlord, and the son of two parents who zealously joined the revolution only to be discarded by later 'struggles of the Proletariat'. Ye Fu was only dimly aware of this heritage growing up. It was not until his father's funeral, when he first stepped foot on his ancestral lands, that he had either the chance or a reason to find the truth of his family's past. This became a quest that drove and consumed him and is a recurring motif that unites his most poignant essays. Ye Fu's father, Zheng Yonghuai, was born in the late 1920s in a remote Hubei village near the Qing River. To most of those who knew him as an adult, his story began in 1949. That is when, having left his home in a mountain village to study 50 miles away in Enshi, he joined the Communist Party of China (CPC), enrolled in one of its new colleges, fought in its war, and then waged revolution against bandits and landlords who could not be tolerated under the new regime. When the revolutionary struggle was over and peace was declared, a promotion to district secretary followed, as did assignments to supervise mines and iron works. Yet in revolutionary China struggle could never be over, and during the Cultural Revolution he was in turn struggled against. The happiness that came from his political redemption during the post-Mao reforms was tempered by the imprisonment of his only son, jailed in 1989 for supporting the democracy movement. Before Ye Fu was released from prison his father died an old and weary man, worn down by a life controlled by others' caprice. It was Ye Fu's responsibility to fulfill this man's last request: scatter his ashes on the Qing river so that they might be brought to rest in his ancestral home. Thus the true details of his father's life and heritage were revealed: a grandfather who had climbed from the peasantdom of his birth to the hallowed class of landlord only a few years before the revolution overtook the village (he earned the title by being the only one in the village rich enough to employ a single field hand); a son who zealously hunted down landlords for the Party, unaware that his own family 50 miles to the east suffered the same persecution he so earnestly delivered; the suicide of his father and the destruction of the clan's eldest generation in its entirety, both brothers and wives, within a single night. "Hundreds of millions of lives were shoveled into the trenches of the 20th century," Ye Fu reflects. Historians estimate that the death toll of these land reform campaigns is in the range of two to three million. But for Ye Fu those ditches are not those of the nameless millions. These were ditches dug by his father and filled by his grandfather. The tragedies of the 20th century are his tragedies. He was born from the ditches--though he would not discover this gruesome truth until he was a grown man. He who reads Ye Fu's meditations on these mournful roots leaves with the strong--but unexpected--impression that the true tragedy of modern Chinese history is not found in its colossal death toll. For Ye Fu the real tragedy is what all these dead represented. The first to die were those most committed to the old order. They were the upholders of traditional propriety, keepers of the ancestral shrine, and symbols of basic human decency. These men and women often lived far below their ideals, profiting from a system rightly seen as exploitative, but as long they lived so did the ideal. Their deaths meant the destruction of their entire society. With them passed old structures of power and control, but also the old values and traditions these social arrangements had embodied and enshrined. The life defined by decorum, trust, filial piety, and kindness lost its place as the ideal of Chinese civilization, replaced by a new model that honored cruelty, deception, and revolutionary ardor. The story of his father's clan and the ravages of land reform comprise the largest of Ye Fu's essays. He traces China's subsequent history through the rest of his essays, each centered on the life of a person whose actions left their mark on his soul. We read of his grandmother and mother's bitter trials, the friend who chose to live an honest life of solitude instead of public life of sin, of the town blind man from Ye Fu's childhood and the aged groundskeeper of an abandoned landlord estate. Each essay reveals a little more about the past Ye Fu labored to uncover. The end product of his efforts is an intensely personal portrait of China's last seven decades. Ye Fu writes these essays as a man of letters. He is neither a historian or a social scientist; his work does not properly belong in the same category as famous narrative accounts of revolutionary tumult, like Jung Chang's Wild Swans or Liang Heng's Son of the Revolution, not does it fit comfortably with the kind of meticulously sourced and statistics-crammed analysis found in Yang Jisheng's Tombstone. His essays are meditations, less concerned with parsing the specifics of political campaigns than analyzing society's reaction to them. Again and again he asks: in a world where man is cruel and in a land crueler than most, how does a person committed to goodness persevere? What room is there for nobility and decency in a society gutted by tyrants or putrid with corruption? By focusing on the trials and triumphs of individuals Ye Fu adds a glimmer of hope to what would otherwise be a very dark account. He affirms that decency can be found in the midst of insanity; for all of its cruelty, revolutionary China could not drive nobility out of the souls who valued it most. This is the lesson that lies just beneath the tears and pains recorded in Hard Road Home. A noble life can be lived in a world hostile to nobility. Ye Fu's lesson could only be discovered through a personal odyssey through his family's tragic past. His is a pattern many others could follow. Unfortunately, those who have the most to gain from his approach are the least likely to apply it. The curse of modern China is not the insanity of revolution, but the apathy of fortune. The hardship of the Cultural Revolution leads Ye Fu to state, "my childhood ended at the age of four" ; many in China's rising generation never seem to leave childhood at all. So many today evade the civic responsibility expected of past generations. They glimpse the abyss and then turn away. Those of us in the West need not turn away. Ye Fu's meditations provide a pattern just as useful for the contemplative Westerner as for his Chinese readers. He does not simply confront the terrible facts of his civilization's past, but accounts for them, patiently and poignantly drawing the humanity out of a cruel and corrupted history. Those possessed by the need to "honestly" face the sins of our past can profit from his example. As Ye Fu's character portraits beautifully potray, integrity is not a matter of learning to face the hard truths of our world honestly, but learning to live honestly after the truths are found. Note: Ye Fu's essays have been translated by Andrew Clark, who not only translates the book beautifully, but includes 25 pages of detailed notes to provide cultural and historical context. The collected essays are 149 pages in length; in addition to the notes, two maps and several photos are included to aid the reader. The book is published by Ragged Banner Press, a small press devoted to translating "works of literary merit that express independent Chinese views grounded in humane values and historical honesty." The book can be purchased at the Ragged Banner Press website. There is also an excerpt of one of the essays on the website. David Bandurski, "Politics gets personal in left-right row," Chinese Media Project (26 April 2011). Ian Buruma, "China: Reeducation Through Horror," New York Review of Books (9 January 2014). None of these five men are active bloggers or columnists. However, I have been impressed enough with their theories, general erudition, or the sheer scope of their work to set up a Google Alert  on each of their names, so that I am notified if they publish a new essay or are included in a new roundtable discussion or interview. Vaclav Smil: The word polymath was invented to describe Mr. Smil. A sampling of just some (!) of the books he has written in the past four years: Made in the USA: The Rise and Retreat of U.S. Manufacturing, Should We Eat Meat? Evolution and Consequences of Modern Carnivory, Why America is Not a New Rome, Harvesting the Biosphere, and Energy Transitions:History, Requirements, and Prospects (see the full list of books currently in print here). Every book Mr. Smil writes would be the product of a lifetime of work from almost any other scholar. Conversant in all fields and an expert in more than a few, Smil's work is dense, data driven, and absolutely necessary for understanding how the world works. His Energy in Nature and Society: General Energetics of Complex Systems changed how I think about human society and history--as can be seen in some of the most popular historical essays on the Stage. Azar Gat: Mr. Gat began his scholarly career studying the evolution of European strategic thought and the connections between European intellectual history and the way war was actually waged. These works are considered classics in his field, but what sets Gat apart from other scholars is his magisterial War in Human Civilization. With War in Human Civilization Gat managed to synthesize the work of biologists, ecologists, psychologists, anthropologists, historians, sociologists, economists, strategic theorists, and political scientists into one cohesive whole. He does not present a general theory of war and civilization (thank heavens! ), but does touch upon almost every single aspect of human society before the work is completed. I do not agree with his take on everything, but I am more than willing to listen to his take on anything. It is difficult to take seriously the work of scholars opining on human conflict or the dynamics of human civilization if they have not read anything by Azar Gat. Robert Putnam: Robert Putnam is best recognized for his book Bowling Alone, in which he showed how across America 'community' - or as he called it, 'social capital' - had fallen apart. The importance of social capital for the proper functioning of society is a recurring theme of this site and I have cited Bowling Alone many times here. Mr. Putnam's other work is less well known but equally illuminating. His first book, The Comparative Study of Political Elites, has been largely forgotten. This is a shame, for it offers one of the only coherent theories of elite power I've come across. His most recent book, American Grace, is the best single work on American religious practices and trends; those who write about broad social trends in American life without referencing the data inside it usually sound a little silly. Robert Putnam has now turned his attention to the way growing economic inequality is changing American social values, practices, and capital. I can only hope he turns this work into another book; the research studies he has produced on the topic are interesting enough to deserve one. I met Mr. Christensen when serving as a missionary for the LDS Church in the New England area. It was here I came across another group of his writings on how to best strengthen LDS congregations and be an effective missionary. Many of these writings are now available on the website Missionary Leaders. Mr. Christensen's approach to gospel service and his approach to life in general has impacted me deeply. Like the other people on this list, he is a wide-ranging, first rate thinker. His op-ed, "The Capitalists Dilemma," is one of the most important articles published on American political economy in 2013. I eagerly await the book-length version to be published later this year. Siddarth Vadarajan: I started following Mr. Vadarajan when he was the strategic affairs editor for the Hindu. This meant it was his job to write the monthly editorials on geopolitics and international affairs--he did this with an analytic clarity few Americans could equal! Mr. Vadarajan's insights were valuable on their own merits, but for Americans like myself his clear thinking and prose provides an excellent vantage point to understand how the India's policy elite perceive world affairs. For the last few years Vadarajan has been employed as the Hindu's lead editor and has thus written very sparingly (though he did manage to make it onto the list of authors for the excellent Non-Alignment 2.0). He resigned from his position at the Hindu in 2013 and it is not clear if he will be writing in the future. I can only hope that he continues to write about world affairs. EDIT (3 April 2013): I have been informed that Siddarth Vadarajan now has a blog! It looks like he started posting new pieces during December of last year. I actually don't use Google Alerts, but Talkwalker Alerts for this purpose.